Reviews | Regal Ground Cardamom - 16 oz. 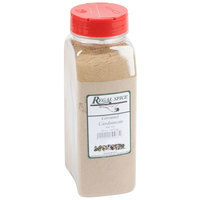 Regal Ground Cardamom - 16 oz. Common in many Indian, Scandinavian, and Asian dishes, Regal ground cardamom is an excellent addition to any kitchen or bakery! A member of the ginger family, cardamom has a warm, fresh taste with floral and citrus hints. Its pleasing flavor and aroma complements many dishes that are sweet, savory, or spicy! Infuse cardamom flavor in meaty stews, pilafs, poultry, curries, and more. It's also perfect for braising vegetables or baking breads, coffeecakes, and other pastries. Mix it into your signature coffees or teas, or use it to create an authentic Indian chai tea that's both spicy and sweet. Cardamom pairs well with a variety of other sweet spices, including cinnamon, nutmeg, and cloves. I love all of my regal spices! I have always used cardamom in my stews but I never really knew how versatile it is. I have been using it in so much more now. I couldn't be happier with Regal ground Cardamom. It added just what was needed for my cookies and pies. The price is excellent as well. I would recommend it. The regal ground cardamom is a great baking spice for our peach tarts and a great spice for our sweets shop. Very bold and adds a great kick of flavor. The ground cardamom is awesome and very good in our baking. The flavor the spice adds is warm and delicious. Really helps enhance the flavor of our cookies and pies. Freshly ground cardamom plays a pivotal role in just about all authentic Indian cuisine. For that reason I knew that I need to look no further than Regal Spice when the time came to start putting together our Tandoori Chicken dry rub. The fragrance is unparalleled and the flavor is absolutely out of this world. I'm thankful that Regal Spice has the vast offering that they have as it has allowed my company to test different flavor pairings as we work through our several iterations of product development. My husband a retired Chef uses this is all his Asian and western receipes . The cost was perfect for us, and the size also. The taste is fantastic compared to name brand spices. Never had any complaint from family or friends either. A really nice ground cardamom that was great for our peach and cardamom bagel spread. A great twist and everyone loves the great tasting spread on our bagels. This cardamom is great! We use it in our tumeric latté mix, and it tastes delicious. We love that we can buy spices in bulk through Webstaurant, and the price is right. I recently discovered cardamom and have enjoyed incorporating it into my baking. The cardamom is a wonderful quality spice that has a some great attributes. A really nice warm tasting and smelling spice. A very warm and soothing spice that is great for adding to your tea. The cardamom is excellent and a nice texture. Really good buy. A nice container of ground cardamom that is very fresh. Love using cardamom in my baking. It adds a nice warm flavor to my dishes. The regal ground cardamom is very strong and makes a great spice to add to stewed peaches. The spice is a must when baking because it really enhances your baked goods' flavor. The ground cardamom is a great quality spice and is wonderful for making our gourmet style Danish pastries. The cardamom adds a nice hint of warmth to the pastries. I love using the Regal ground cardamom in a special cookie recipe I make. Cardamom also has great health benefits too. This product is a great one for quality and value. Great spice I use in my authentic dishes has a citrusy aroma to it and for this price you get so much compared to other vendors. Highly recommend to try. We like this spice, we add it into our sugar cookies, pies, and selective pastries. Warm and mellow sensational flavor. Great for the cold holidays. This is the key spice ingredient for our signature sweet rolls and Christmas Stollen. The quality and price point are excellent; online is so convenient. Shipping is quick to arrive. I cannot say enough things about how great Regal brand herbs and spices are. They are just as good as name brand but will save you tons! Cardamom is delicious. Warm, citrusy, dark, yet bright, it adds a lot of interest to anything you put it in. It's one of those flavors you can't quite put your finger on. A really nice quality spice from a great brand. It is very pungent and flavorful and goes great in a variety of dishes. I love the cardamom in my tea. Cardamom is a great spice with a warmth that really adds extra depth to you food. I use this on my stewed peaches to make a really great peach, cardamom jam. Cardamom is normally a pricier spice in the local grocery stores. It's got a really interesting flavor and pairs well with other fall spices like cinnamon and clove. Cardamom has such a unique flavor. I love it when it says paired with orange in desserts for an extra bit of interest. Great price. This Regal ground cardamom has the best taste and smell. Extremely fresh and i love being able to buy it in this 16 ounce quantity! WOW! This cardamom beat all of my expectations. Cardamom is usually very pricey for a small jar. I was a little skeptical when I purchased this 16oz bottle at such as cheap price. The flavor is still just as pungent and bold as other brands. We make a peach and cardamom preserve and this help us keep the same taste but at a much lower price. Cardamom is such a great spice with wonderful health benefits. I feel good about the spices I get from Webstaurant because I know I can trust the quality. It’s wonderful that their spices are also affordable. Fantastic Taste, and Consistency. The price is great too for the 16oz container. We don't use this a ton so it does last. But we do add it to our Carrot Cake, and some other batters for an extra depth of flavor. Would highly suggest! Nice medium package of ground cardamon. Great aroma and perfect flavor. Easy to cook with because of perfect texture which absorbs nicely! Great product for a great price! Cardamom is a Indian and Norwegian spice that is very healthy for you too. It is alkalizing and has antioxident properties. Good with sweet cinnamon spices in yogurt or pumpkin or in baking Krumkake, but be careful to use a small ammount- it is very strong and a little goes a long way! Great price for the amount of Ground Cardamom I got and the quality of the product went beyond my expectations. Will definitely get next time! I am very pleased with the quality of this cardamom. I would highly recommend this. I use it in my bakery almost every day for different breads. This is a great price for cardamom and especially for this amount. It's one of those spices which is often substituted due to availability and price but makes treats extra special when used for the exact recipe. Very expensive in a grocery store!! We use cardamom in many of our baked goods. Great price, good quality, will continue to purchase this product. This regal cardamom is beautiful and light in color! It tastes better than the high priced ones !! It is great in addition to sauces and I also secretly put this in my smoothies! Love it! Ground cardamom is so tasty in lattes, coffee smoothies and even mixed with cinnamon in waffles and pancakes usually it is too expensive here the price is just right. We found this to be an incredible price for good cardamom compared to what we are offered locally. Excellent taste added into curry powder mixes. I am always cooking and am always in demand for spices. Luckily I came across this site a few years back. I was paying double for the same thing. I will recommend this site to eveyone that is looking for bargains. Matter a fact my mother now biys her spices here now. i bought this to make my own spices mix for many recipes of my own. Only found out that the price is so cheap and comes in so much that i love it.